One of the keys to being able to build useful smart playlists in iTunes is having your tracks ranked. 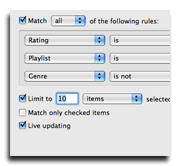 (It’s so important that I made it #4 on my Five Tips for Smarter Playlists a few years ago.) I try to be vigilant when it comes to ranking my songs, but (a) I need to hear something quite a few times before I’m ready to rate it, so new stuff is almost always unranked by default, and (b) I still have hundreds of mp3s from a decade ago that I have yet to rank. That’s why I have a smart playlist called “Unranked”. This set includes the ten songs I’ve heard most frequently but have yet to rank. I exclude holiday music — because who wants to hear Jingle Bells in June? 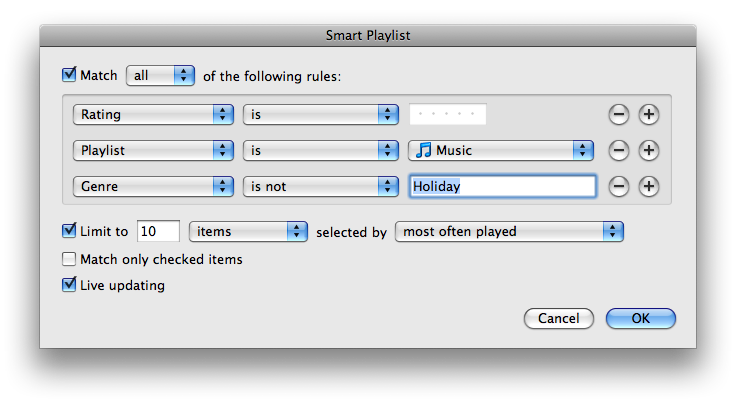 — and limit the list to the “Music” master playlist to avoid music videos and episodes of Schoolhouse Rock.